I think I might get a bit involved in Second Life again. Internet engagement tends to be cyclic, as I already observed back in 2008 in a post entitled Boom and Bust. It now appears that one’s level of participation can go through both short cycles and long cycles. 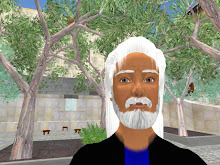 My first long cycle of engagement in Second Life lasted, with a few minor interruptions, from my avatar’s birth in late 2007 to the time of my last prior post in May 2011. Since then I have been “away” from Second Life for several years, doing other things. This time around my plans will be more modest. My main goal will be just to maintain some sort of Second Life presence. Maybe I could start by learning how to buy a new set of clothes. In general, it seems that the higher you plan to fly on the upswing (the “boom”), the flatter you fall on the downswing (the “bust”). Thus the first principle of sustainability: less is more.